No more wasting valuable range time messing with tape or staples! 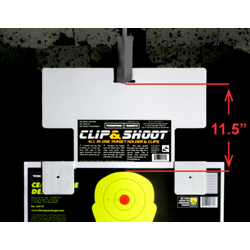 Clip & Shoot indoor reusable target holder allows for quick, easy, and clean placement and removal of your targets in just about any indoor range carrier system. The Clip & Shoot also drops the aim point about 1 foot and greatly reduces the chance of stray shots hitting the target carrier or ceiling. Made from ultra durable coroplast that doesn't easliy break down after multiple shots like cardboard. Thompson Target's Clip & Shoot also holds target securely in place even after many uses. Clip & Shoot measures 15.5" wide, 11.5" tall, and the pins are placed 12.5" apart. Don't go to the range without one! Great product, easy to use and allows for quick changes of targets. Holds targets securely and prevents curling of upper corners of targets. These products help save my main target hangers from damage. These target holders are what they use at my local range and they're great. I ordered some for myself and they came quickly.